It’s the time of year for holiday parties, Christmas cookies and egg nog. Sounds like a great reason to host an open house at your business. An open house doesn’t need to be extravagant, costly or time consuming. However, it is a great way to open your doors to the community, your customers and spread some extra cheer during the winter. If you have an actual store, especially in town or on the edge of town, perhaps hosting an open house makes a lot of sense. It is a chance to promote your business and share in the spirit of the holidays. Often, smaller towns will have a holiday parade, dedicate one night a week when they are open later for shopping or have a community bazaar. These are ideal times to hang a little garland, turn on the coffee pot and host your open house. If you are an on-farm dealer, you can still host an open house; it might just take a little more planning and preparation. You might put more effort into promoting your event and issuing invitations. You can tidy up the shop or barn where you store product, and still put on the coffee and show your appreciation for your customers – your community. First, you need to establish a date when you will host your open house. Find out when other events are happening and if it makes sense, plan your open house with those. If there are not a lot of other community holiday events, plan your event during a time when there are not other local community events like a basketball game or concert. Promote your event through local advertising, your store sign, a poster on your door and your social media channels. You might even want to make some phone calls to key customers or potential customers. Next, plan what will make your open house special from regular store hours. Will you offer food and beverage? What will that involve? Are you thinking sugar cookies and punch? Meat balls in the crock pot with cheese and crackers? Or something more substantial like sandwiches and chips? Whatever you do plan, make sure you have plenty to offer. Nothing is worse than having an event and running out of food. Provide a learning opportunity. Especially if you are a storefront, maybe not everyone in the community knows what products or services you offer. Make yourself available to share your story or have some type of game or entertainment to showcase the products. Think a store scavenger hunt or BioZyme® Bingo. Give back to the community. Perhaps you can have a toy drive for local kids or a pet supply drive for the local animal shelter. Make it interactive – bring in a toy or purchase a bag of dog food to leave for the pet shelter and get a $5 off coupon toward your next purchase. There are a variety of ways to give to others this time of year. If you are an on-farm dealer, your open house might resemble that an open house where you get together with friends, neighbors and customers. People are always looking for a good reason to slow down for bowl of soup and good conversation. And remember, you can also take part in community opportunities and spread the cheer. 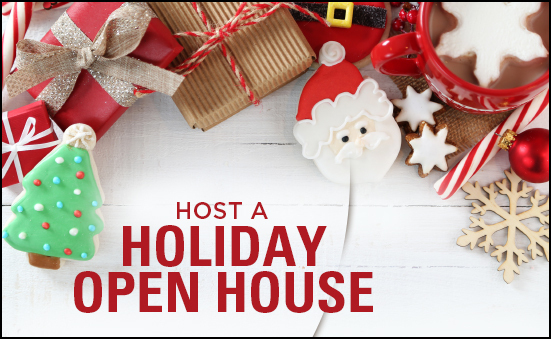 For more ideas on hosting a holiday open house, contact Ashley Fitzsimmons at afitzsimmons@biozymeinc.com or (307) 575-1082.